He was determined. And stupid. 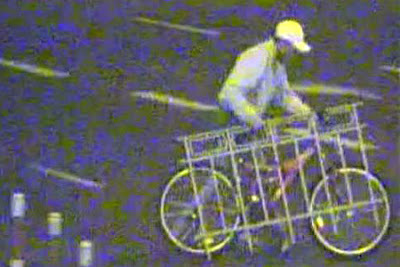 This week, Janosz Kolbe of Warsaw, Poland decided to steal a bicycle. Unfortunately, the owner of the bike chained and locked the bike to a fence. Not a problem. Since Janosz was unable to open the lock, he decided to steal the bike and the fence (see picture). Janosz apparently had not stopped to ponder the fact that a guy walking down the street with a fence attached to a bicycle will attract a lot of attention. Not only that, but such a bicycle presents a problem when trying to run from police. Janosz was caught by the police and will be behind a different sort of fence for the next five years.